A Church Near You (Church of England site for this church). Church Lane, Albourne, West Sussex BN6 9BY. Grid reference: 525700, 116200, View on: Google Maps, Open Street Map, Streetmap, National Library of Scotland Map or Oldmaps. Church of England Clergy Database. There are 1750 baptisms in the OPC database. IGI Batches: C070001 (1550 ~ 1571); E070001 (1550 ~ 1571); C040442 (1621 ~ 1882); C070002 (1703 ~ 1874). There are 326 marriages in the OPC database. IGI Batches: M070001 (1605 ~ 1784, 1813 ~ 1876); M070002 (1605 ~ 1702). There are 6 images of this church in the OPC database. ST. BARTHOLOMEW. 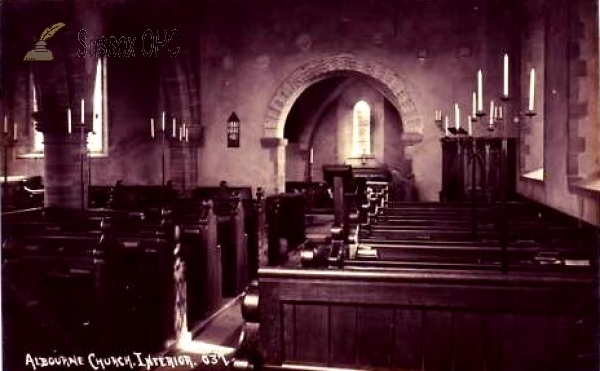 Rebuilt in 1853 with the exception of the chancel, which has the old arch with chevron; there is a peculiar pointed arch over the altar, and a piscina. An old arch of nave has been built into the wall of churchyard. Archbishop Juxon, who when Bishop of London attended Charles I. at his execution in 1649, lived at Albourne place.